Everton completed a smash and grab job to claim 3 points in what was a pretty disjointed display by the Blues characterised by poor passing in the second period. Everton opened up in a 4-2-3-1 system with Anichebe leading the line with Osman behind him, Barkley from the right and Arteta left side. The 3 attacking midfielders interchanged a fair bit with Arteta moving inside more as the game went on with Osman shifting to the right. 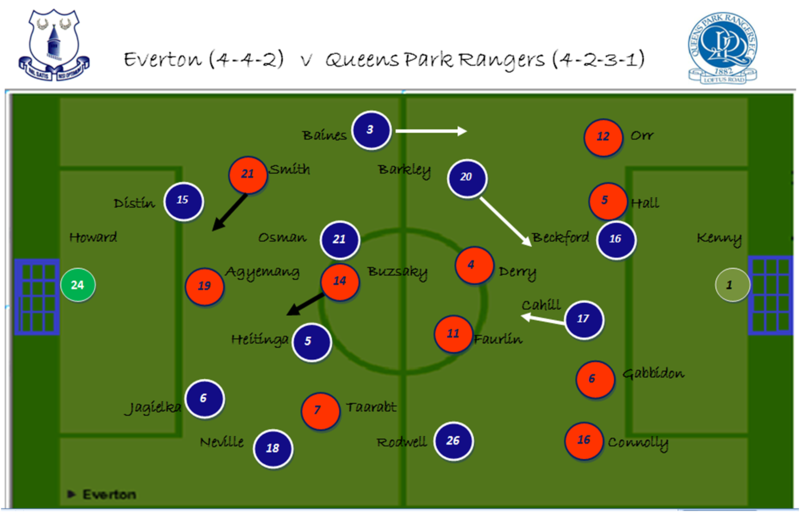 Blackburn played more of a 4-4-1-1 with Hoilett playing through the middle off Jason Roberts. Injuries to Pedersen and Dunn would see Hoilett switch back to the flank midway through the first period. The second half was a horror show for the Blues. As the stats show below, we couldn’t get hold of the ball and when we did our pass completion dipped. 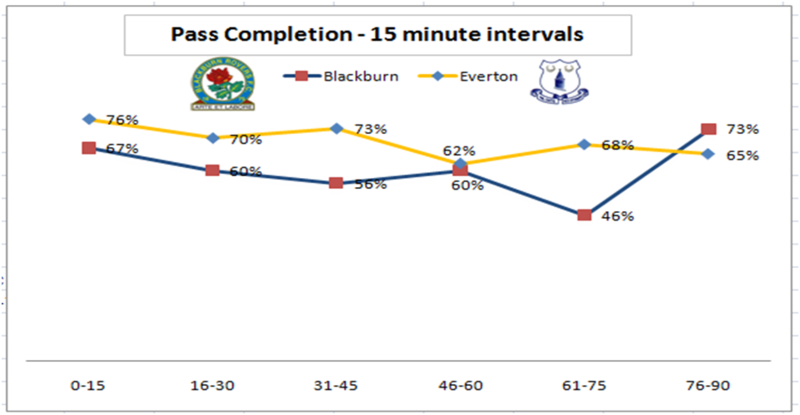 Blackburn made considerably fewer passes but made more of their possession than the Blues – their % of long balls was 3% higher than the Blues and they worked the ball into our box much quicker. The Blues defence continued to drop deeper and deeper as the second period progressed – Distin made a huge 16 clearances but 50% of these surrendered possession to Blackburn. 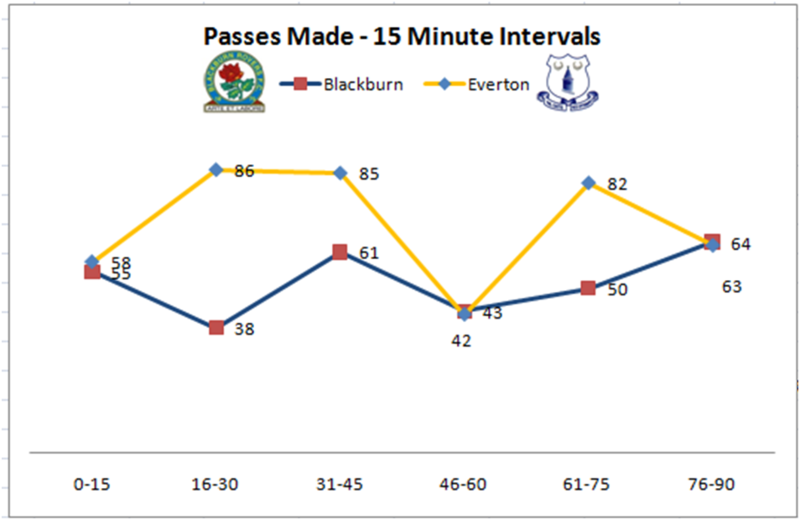 Our passing was increasingly poor – both Blackburn penalties came from passing miscues – firstly Barkley and then Cahill later on. The Blues rode their luck to get 3 points here; Blackburn missed two penalties and also lost their 2 most creative players to injury. The positives where good defensive shifts for the team from Fellaini and Anichebe – who both won over 90% of their aerial duels supporting a defence that looked shaky with Jagielka again out of sorts. 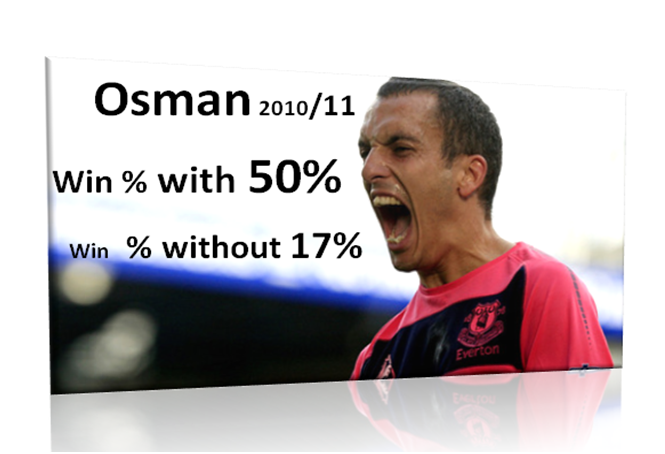 Osman was anonymous in one of his poorest games in a long time. Tim Howard will take the plaudits as he saved the Blues and buried the ghost of his nightmare at Ewood 12 months ago. Ultimately last season we started the campaign battering teams with possession and getting nothing, so 3points and a clean sheet will do nicely although we certainly need to improve in terms of passing based on today’s showing. The Blues head to Ewood Park looking to register their first points of the new season against a Blackburn side also looking to break their duck following back to back defeats in their opening two fixutures. The home side will line up something resembling 4-4-1-1 potentially with Rochina playing off the striker after his double blast against Sheff Wed in the League Cup this week. Steve Kean inherited a pretty robust outfit from the Allardyce regime and their strength remains in defence and prinicpally their 2 centre backs Samba and Nelson – the pair havent started a game together this campaign but are due to be reunited for this fixture. In midfield expect Pedersen to cut in from the right and the main danger to come from the left where Hoilett is probably the only player on the pitch with genuine pace in wide areas. Their deep lying playmaker Dunn will be looking for the leftside as the outball at every opportunity. Only Stoke averaged less possession (41%) per game and a lower pass completion (65%) than Blackburn last season. 21% of their passes where long balls in comparison to ourselves (17%). It does seem though that the players Kean is bringing in are less ‘win ugly’ than Fat Sam and that he is trying to evolve the style of play somwhat. Their threat is in the air and at set pieces which accoutned for 18 of their goals last season; only Newcastle (20) scored more from deadballs. The Blues will need to be razor sharp to contend with this and it wouldn’t be a suprise if Anichebe was drafted in to assist with this on the wing. The midweek win over Sheff Utd was a welcome boost for the Blues. Like the opening to last season, its difficult to predict who Moyes will start with in the offensive slots – whoever does though will need to display better movement than last weeks offering QPR which undermined the entire display. More was made of the fact the Blues had no recognised striker on the pitch – but modern football is about less about ‘2 up front’ and more about intelligent movement from a striker coming deep and dragging defenders with them to create space for attacking midfield players – Man Utd’s last Champions League success was based on Tevez doing just this – all the goals came from the players exploiting the space he created with Rooney, Ronaldo and Giggs the main beneficiaries. This will be a tight game – neither side has particularly great speed and both find goals hard to come by. Whoever defends crosses into their box better will be in with a shout of winning this one. I’m going for the Blues to sneak it 1-0. The Blues are waking up to another opening day hangover after a defeat which provided a microcosm of the familiar woes faced last season, chiefly a lack of cutting edge with Cahill the #1 culprit. We lined up in a pretty orthodox 4-4-2 with Heitinga holding and Osman given the attacking duties from central midfield. 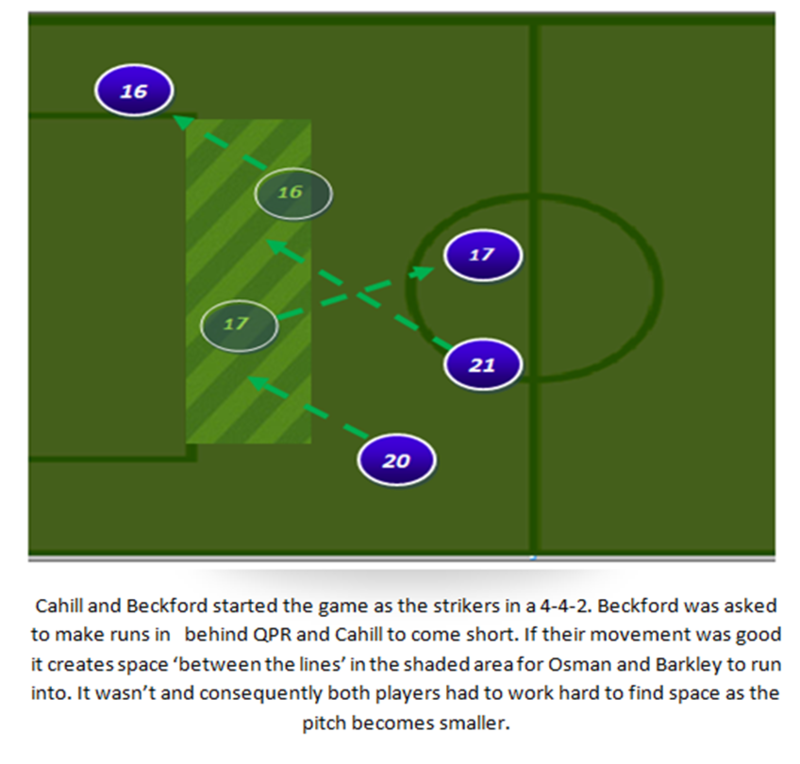 Cahill played right up top with the dire Beckford. QPR lined up in 4-2-3-1 with Smith and Taarabt in the wide roles but attacking predominantly down their left flank with Smith angling runs from the right. Personnel wise, the Heitinga/Osman central midfield and Beckford/Cahill axis didn’t look convincing and resembled players who had rarely been paired together. The team generally looked unbalanced with 2 central midfielders playing on the flanks. Rodwell was again accommodated, this time in a wide midfield role with the onus to get forward and create when possible. As discussed in my When Skies are Grey column pre match, Rodwell lacks a creative spark to his play and is quite robotic on the ball; for instance last season he created a chance for an opponent every 202 minutes. As the chalkboard below shows (bottom chalkboard), he made just 2 forward passes in the opposition half all game – I’d play him anchor man or not at all. 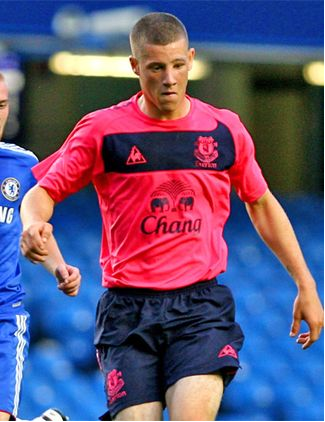 Barkley’s display was unquestionably the only positive – he does possess the ability to take a player on which we lack. The chalkboard (left, top) shows his passing adventure with a significant amount of forward passes. Barkley had more shots and more dribbles than his teammates and was also our most fouled player, picking up useful free kicks on the edge of the QPR goal. I would personally start him next week at Blackburn in a 4-2-3-1 alongside Arteta and Osman and behind Saha. Our hosts where decent in possession and in Alejandro Faurlin had the games most effective performer, just shading Barkley in terms of output. The Argentinian midfielder completed 81% of his passes (well above the QPR average of 69%) and won 10 tackles. His role was to break up play and feed the attacking midfielders, something he did in the build up to the goal. As the below shot shows we afforded Buzsaky too much space following a prolonged period of possession from the Hoops. The Hungarian finds time and space to roll the ball into Tommy Smith to slot past Tim Howard. It was a terrible goal to concede. 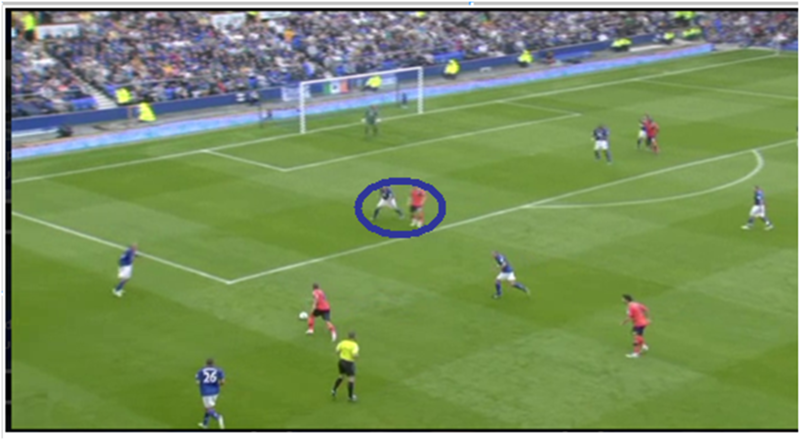 Baines and Jagielka both had opportunities to clear their lines but rushed clearances and returned possession to QPR. As the move progressed, Jagielka was again guilty, this time of poor marking (circled) he has Smith marked but then gets sucked in enabling Smith the time and space to slot. 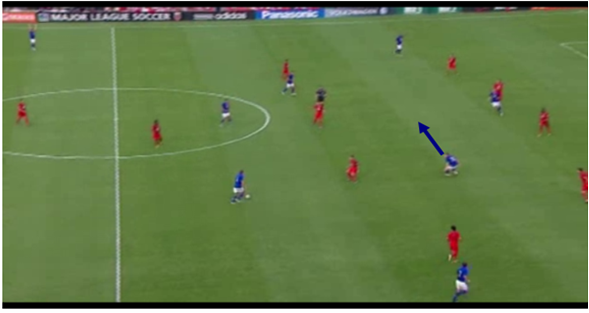 The second half was more of the same from the Blues; Barkley switched to the right to accommodate Arteta on the left. Beckford was then withdrawn with Cahill furthest forward with Fellaini supporting him – a move that made us look more threatening but ultimately to no avail. The Blues were slack and lacked a cutting edge but still created enough goal scoring chances to take at least a point –it was a familiar story of square pegs in round holes selection wise and a lack of bite in the final third. A reaction will be required against a woeful looking Blackburn side next week – as mentioned above I would return to 4-2-3-1 with Osman further forward. Fair play to QPR – they had a plan and stuck to it – and in Faurlin they have a class act who will claim many plaudits this season with more showings like this. I would expect Barkley to figure at some stage but from the bench. The lack of transfer activity will mean there will be little variation in terms of tactics and strategy to how we finished the campaign. I would expect us to continue the more direct game plan that secured us a storming finish last season with Baines playing pretty much as an extra midfielder when we are in possession, whipping in crosses at every opportunity. Last year’s Player of The Year will fancy his chances if pitted against Bradley Orr; a distinctly average Liverpool born player who once head butted his own captain in a match in the same week as being sent to prison for a nightclub altercation. Back to the football…..an early goal would be ideal for the Blues given that our home form is pretty decent especially when we score first. Its 3 ½ seasons and 67 games since Everton last opened the scoring at Goodison in a league game and didn’t take at least a point. So what do we know about the West Londoners? Back in 1993 they put five past us in one of the most miserable Goodison days in living memory. They certainly have a creative force in danger man Adel Taarabt. Last season, 53% of their goals where either assisted or scored by Taarabt – most from his magical right boot. Bolton’s comfortable rout on the opening day made one thing clear; shut out Taarabt and there is not a massive amount in terms of craft elsewhere in the team. On the opening day Taarabt started playing off the decent DJ Campbell, with wider support from Smith and Jay Bothroyd – a player the Blues thankfully swerved in the summer. Taarabt mostly enjoys dipping into the left channel and cutting in on his right side as shown in the below shot. Bolton’s former £10m man (!) Nigel Reo Coker did a pretty decent job subduing the Moroccan; winning 6 out of his 6 tackles with another one time supposed Blues target Chris Eagles providing good defensive support to his fullback on this side also, winning 5 out of his 7 challenges. I would expect Fellaini to go after him aggressively on the occasions he does see the ball. 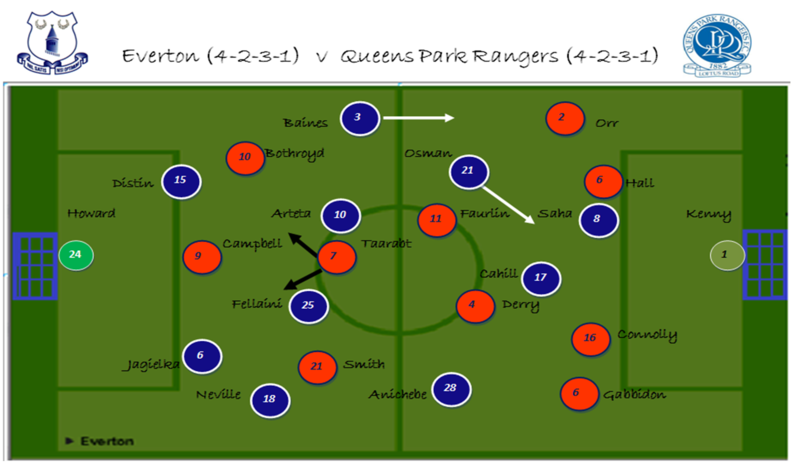 QPR will probably line up in a like for like 4-2-3-1. They have issues in the fullback slots going into the weekend fixture; Kieron Dyer’s glass legs only lasted 4 minutes of his debut, whilst on the left side Clint Hill was dismissed for a moment of madness on Petrov. The Welshman Gabbidon could switch to left back with Matthew Connolly central and Bradley Orr right back. QPR’s pass completion last week was 63% -, which isn’t too shabby – certainly better than Stoke. Despite having more Premier League experience than some of his colleagues, Gabbidon is a liability. An own goal topped of a miserable debut for the Welshman last week – his passing completion was a truly dire 50% – if starting left back it would be advisable for the Blues to press QPR’s other fullback to ensure that Gabbidion is the ball option for Paddy Kenny. The Blues really need to capitalize on what looks a very winnable fixture. QPR are still wet behind the ears in the big league and whilst I would expect Warnock to go defensive after last weeks humiliation, with our experience and key attacking personnel all fit I would expect a comfortable win. 2-0 Toffees. Welcome to the new season and a potentially over cooked preview from the Executioner’s Bong packed with longwinded arguments, unnecessary stats and haphazard conclusions. Like Everton, EB’s hopes and dreams of a summer shake up was curtailed by a lack of spend so we have had to make do with papering over some of the cracks and a tweaked logo which looks a bit less amateur. This post will look at our preparation for the season, identify reasons to be positive and what we need to worry about as well as the usual tactical guff….. Welcome Back! Pre Season form has yielded 3 wins and 3 defeats. Whilst you “can’t read much into these games” the most recent Bremen and Villarreal displays where reminiscent of last season when we really didn’t look like scoring at any time. From a more positive standpoint, our form in the run in last year was impressive; only Chelsea (30) and Man Utd (29) earned more points than us (27) from the end of the January transfer window….contrary to the belief King Kenny accrued more points than the rest of the league put together in the same period. In terms of the fixtures, home games against QPR, Aston Villa & Wigan and visits to Dirty Arry’s mob and Blackburn would certainly give confidence that we have a decent shot at getting off to a better start than we have done in recent years. Our key strengths centre on our stability as a unit – we have stable management and due to the lack of finance there is no revolving door of players. Only 20 players started a premier league game last year– the fewest in the division. 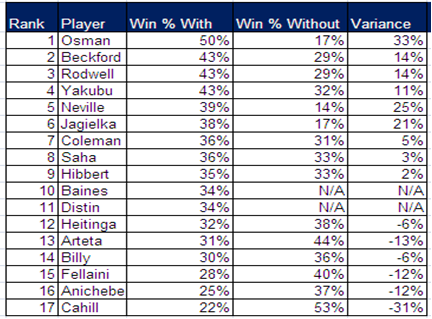 During Moyes tenure we have prospered more when options have been reduced as the run in last season showed. Our key attacking policy due to the lack of pace and ability to counter attack is to slowly build possession with fullbacks (Baines in particular) advancing into midfield to provide an extra man enabling us to work the ball around opposition midfield. The defence is a strength, although last season it was leakier than it has been, Keeping Jagielka will be important – since 2007 we have kept a clean sheet in 37% of the games he has played, compared to 26% when he hasn’t played. In terms of goal times, our above average fitness is reflected in us registering the highest percentage of our goals (27%) in the last 15 minutes of games. Strikers wise, the first choice duo of Cahill and Saha don’t provide a massive threat in behind defences as both prefer to come short – therefore limiting our counter attacking options. There is a significant gap in terms of the squads skill set in terms of pace in wide areas and the ability to beat a man. Only Messi (331) attempted more dribbles than N Zogbia (301) in the top flight leagues in Europe last season. The Frenchman is also noted for his direct running and goals from midfield – areas we also struggle at – and probably why he was moyes #1 target. This fact is made worse by the injury to Seamus Coleman, one of the few players who does provide genuine pace in the side. Last campaign we scored 9 goals fewer than the 09/10 season. The goals conceded from the left side is an issue as teams have targeted our attacking commitment on this side as an area to exploit. General lack of incision in passing and inability to breakdown well drilled sides– the bulk of our chances created are by crosses. However, our goals per game ratio before the Spurs home game midway through the season was 1.05 per game. For the 2nd part of the campaign this rose to 1.66 per game showing that the shift to more direct play did work. We concede the highest proportion of our goals (31%) between 61 and 75 minute periods. 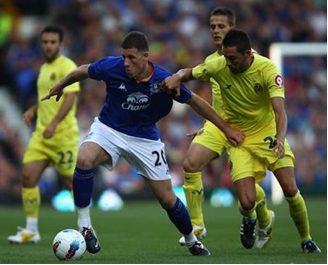 Last season’s most effective players for the Blues were Baines and Osman. Whilst Baines will continue in his wing back role, its likely Osman will be shifted from the central role he excels in to the flanks to accommodate Cahill. It’s our biggest conundrum – on the face of it you would go with Osman given that he transformed our season playing as the pivotal player in a 4-2-3-1. Such is our gaping lack of goals though that it’s hard to leave one of the few players we have in the ranks with a genuine goal threat that opposition teams fear such as Cahill. The lack of invention in the final third, an abundance of players who can play central midfield and the delineation of midfield duties of a 4-2-3-1 means that Arteta will almost certainly start on the flanks this season. It wouldn’t be surprising if Moyes deployed Barkley (sparingly) in the first instance as a wide player who can cut given that he is able to play comfortably with both feet. Fullbacks are the most important position in modern day football. With teams increasingly playing5 in midfield the centre of the pitch becomes overcrowded meaning that teams who use the width better will prosper. An example here is Moyes record v Ancelotti (4-5-1 v 4-3-3) Moyes was unbeaten in 6 against the Italian – principally down to Chelsea playing narrow and us using the flanks. Milan’s successful title winning side last season adopted 4-3-1-2 where the fullbacks provide the sole width – the system is setup for sides that have high energy fullbacks and are strong centrally in midfield and attack. In Baines and Coleman Everton have the players capable of doing this. It also enables Cahill to play behind 2 strikers and mitigates the risk of us not having good options in wide midfield areas. I think 4-3-1-2 could certainly work for us. Last season we finished 14 points adrift of the golden goose of 4th spot which is the furthest adrift we have been in the last 5 seasons and 5 points further away than the 09/10. An article penned earlier this summer looking at the potential impact UEFA’s Financial Fair Play could have on the Blues. Man City’s recent spending obviously leaves us hamstrung, but more of a worry is how clubs like Sunderland despite having inferior management and a significantly poorer first choice starting line-up presently, are closing the gap points wise on the Blues in recent seasons. Indeed, our league position did hide what was a distinctly average campaign for the Blues; we finished 15 points off the final relegation place. To put this into context the difference in each of the previous 3 seasons was 31, 29, and 29 (more than double). Based on last season’s 7th spot and the lack of new faces it would take the most optimistic Blue to suggest that we can better this. In terms of our points tally, this has gradually dropped in the last 2 seasons but this is not to say we can’t have a good season. A decent start would certainly put us on a level playing field (not having to play catch-up) going into the festive period when we traditionally kick on. Heres hoping we get off to a flyer next weekend in London….. Since returning from a double leg break, Ross Barkley has emerged during a pre season of general despondency in the transfer market for the club as a player who could provide an added option to the Blues ranks this campaign. More importantly, his potential could see him long term become a massive player for the club. Barkley showcased his ability to play centrally between opposition defence and midfield lines against DC United above; cutely finding space to receive a ball from Rodwell before slipping Billy through for the second goal. The Wavertree born lad is the epitome of the modern day player being comfortable in numerous positions; indeed he played as a forward in Everton’s FA Youth Cup team. Barkley ‘s versatility would make him even more valuable at a club like ours who started fewer players (20) than any other team in the league last season. 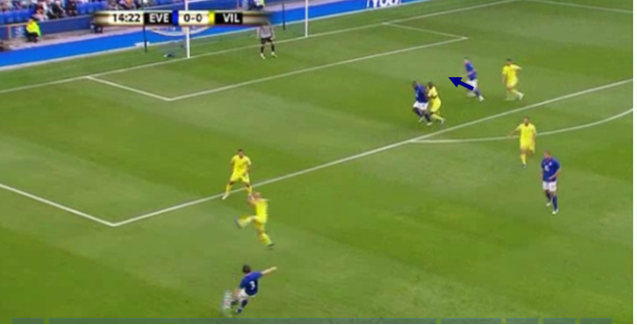 In the Villarreal game Barkley was initially deployed as a central midfielder and showed his willingness to get beyond the striker by almost scoring from Baines whipped delivery here. 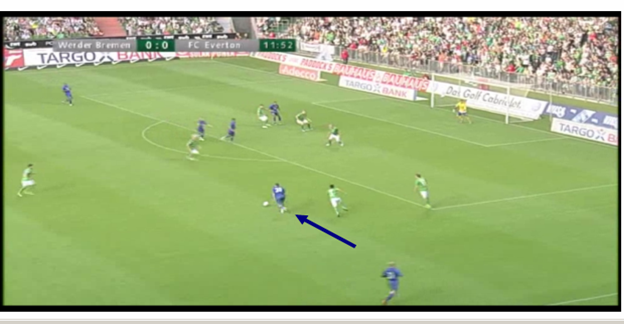 I would see Barkley playing in one of the wide berths, presumably on the right cutting in as he does in the above screenshot atBremen. In a 4-2-3-1 this would mean Barkley playing in the final third closer to the opposition goal where his passing incision (something we lack) will be really useful. Clearly at a time when morale amongst fans is low the Barkley hype will grow but I would see Moyes using him sparingly in the opening months of the season, selecting the games he feels Barkley can grow into the team.